Plants don’t do much all day except sitting around and photosynthesising.Right? Plants move constantly, but much slower than animals. Therefore they manage to trick us by pretending to be really boring. But if you put up a hidden camera, take a picture every minute or hour and put it together to a time-lapse video, they won’t be able to fool you any longer. 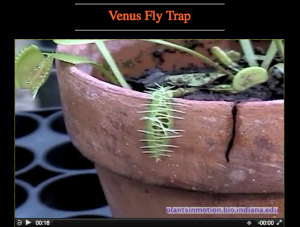 The “Plants in Motion” website created by Roger P. Hangarter has a really nice collection of plant time-lapse videos, ranging from germination to tropism (directional movement in response to an external signal such as light or gravity) and undirectional movements such as the closing of the Venus flytrap. 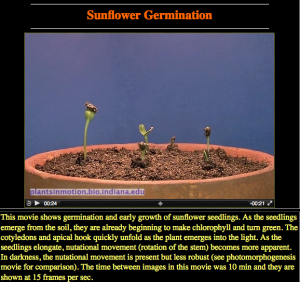 The website also has a section with teaching resources and instructions how to make time-lapse videos. 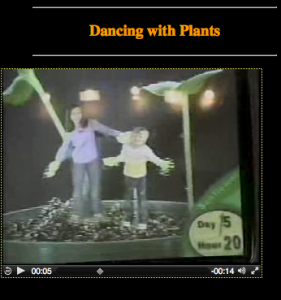 What I absolutely love is their video of the”Plant Dance” exhibit, provided by the Science Museum of Minnesota. In this exhibit children moved in front of a green screen and could see themselves dancing in a flower pot on a screen behind them. By mimicking the movement of plants, children learned more about plant movement in a very playful way. What a brilliant idea – I wanna dance with plants too!! !